The Beef: I will start out with stating that my server was partly responsible for the shortcomings of the beef. The Sirloin and Top Round of the glory days had been replaced with a blend of 80% Chuck and 20% Brisket with a fat content of 20%. She informed me that the beef was still Sirloin and Top Round. It was only after I spoke with the chef, that I learned that this was a predominantly Chuck burger. I would not have ordered that Med-Rare. 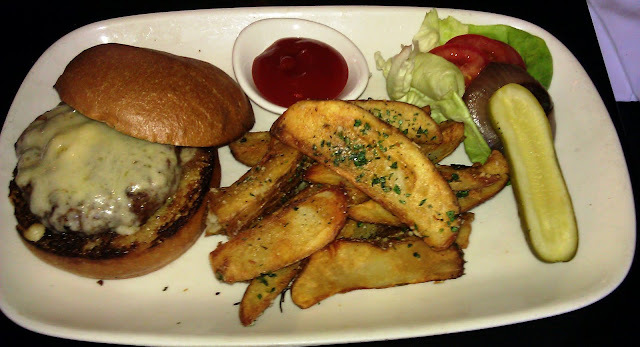 The burger was moderately beefy, but the wet-aged beef provided only the faintest taste of aging. The mineral flavors were strong in the patty, and while this was in part due to the sharp Cheddar cheese, my palate was convinced that it was working with better ingredients. The beef was ground finely, so most of the juices were lost, but the beef managed to be juicy enough. 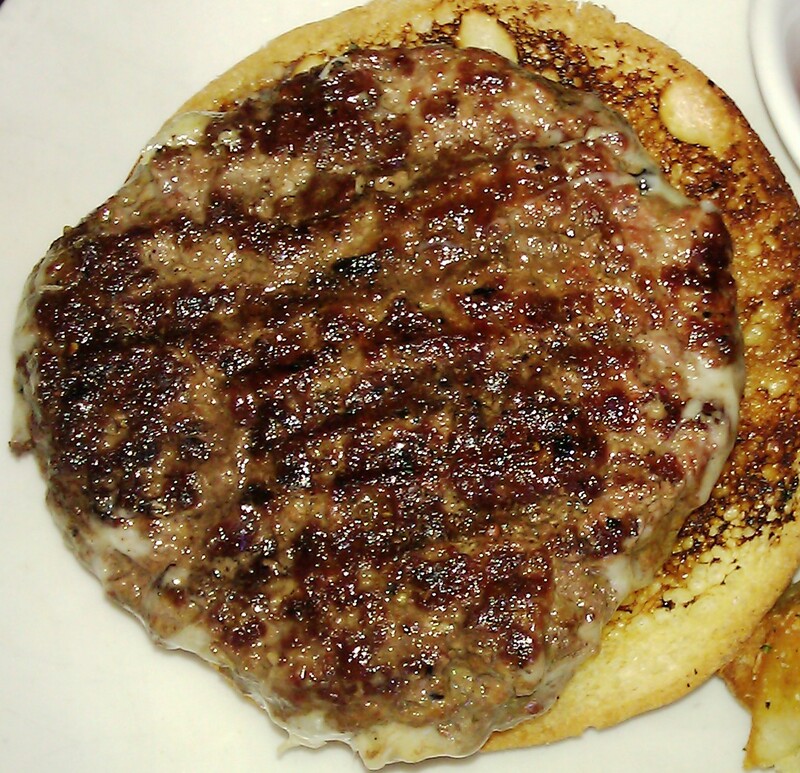 Unfortunately, this burger was now much greasier than I recalled. Overall, the beef was competent and tasty, but too oily. The Seasoning: Formerly, OLiVES tricked out the burger with aged steak fat much like West Branch in NYC did, but since the ingredients had changed, this was no longer the case. The burgers came pre-formed from the meat supplier. WHAT? Yes, it seemed that Bellagio had changed its meat supplier, and OLiVES was bound to use the same burger beef that everyone else got. The patty was properly seasoned on the exterior, and this caused the bite to pop just enough. The Sear: The epic sear of a year ago had faded, and the kitchen applied competent but not exciting grill marks on the 8 ounce disc of Brisket-laced Chuck. This did not create the intense flavors and textures that I had come to love about this burger. The Preparation: The kitchen did nail my request for Med-Rare, although I wish my server had told me the real story on the beef, so that I could have ordered a more suitable cooking temperature. The beef was ground much finer than previously, so the primal, steak-filled mouth feel was a thing of the past. The pre-formed patties were still toothsome and not at all over-manipulated. The Cheese: The White Cheddar saved the day. The well-melted cheese stepped in to fill the gaps that the beef left behind. The cheese was sharp, firm, hearty, and salty with plenty of umami to go around. The iron and other components of the cheese worked their way, seamlessly, throughout the bite to nicely round it out. The Bun: The egg-yellowed brioche came from Bon Breads. It was competent and mostly neutral. Previously, the bottom bun ended up completely drenched in beef juices. That luxury, too, had faded. The buttered bun was nicely toasted, and it had that grilled cheese sandwich feel to the crunch. 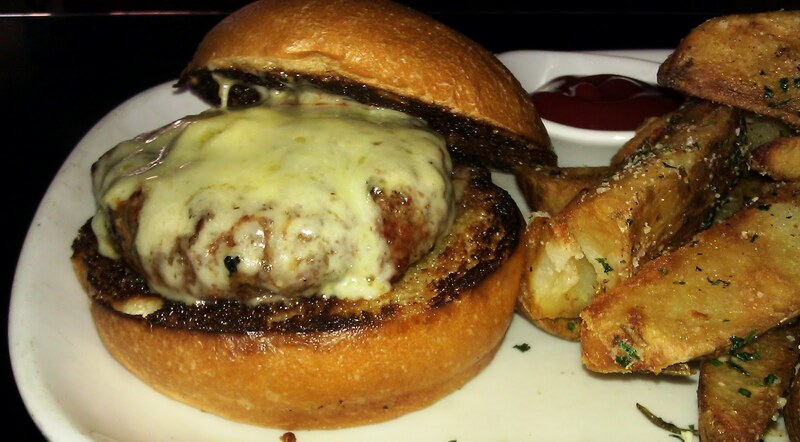 Crisp and buttery, and the crunch on the top bun lasted throughout the entire meal. 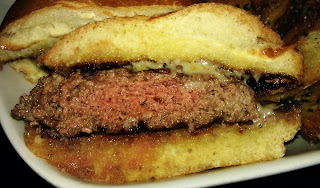 Since the meat was no longer as juicy as it had been before, the bun/beef combination now skewed toward the dry side. The Meat To Bun Ratio: The bun edged out the beef. The Fries: Despair and tragedy…. Formerly, the potato wedges at OLiVES were battered and crusted in salty Parmesan. This resulted in a savory, creamy, decadent, and utterly fantastic side dish. The current iteration of the fries was of the non-battered variety. The peel-on potato wedges were cooked hard in canola oil. The came out an overly dark brown and were nearly bitter. The Parmesan coating that I come to love was not so much a coating as an anemic sprinkle. Parsley, salt, and pepper rounded out the seasonings. The fries went from magnificent to average. The Toppings: The Roma tomato slices were ripe and flavorful, and the Bib lettuce was fresh and fine. The Value: It was 16 bucks for half a pound of pretty darn good, but not great, Chuck. Add a soda to that, and the total (with tax) came out to over $22. The value was weak at OLiVES. Sic transit gloria. Former OLiVES chef Isaac Carter had moved on, and former Sous Chef, Jaime Mendoza had taken his place. Isaac Carter just got burgers, and he made them wonderfully. The current situation was that the once delicious beef blend had been swapped out with inferior ingredients for a reduction in price of about 15%. Chef Carter had great ingredients to work with, and he made them into my favorite burger. Chef Mendoza did not share Chef Carter’s good fortune in the ingredients department, and the once great cheeseburger of OLiVES was now a just a good cheeseburger. Before, I was unable to put that ½ pound burger down, and I would leave stuffed and satisfied. On this visit, I happily pushed the 2nd half of the burger away. Queue up Hero Takes A Fall by The Bangles. Perhaps my expectations and the disappointment that followed caused me to be overly harsh in this review. Executive Chef Mendoza was well-regarded and considered competent. Perhaps the recession necessitated a move to inferior ingredients. Burger Review : OLiVES served a competent, tasty, but overly oily burger. In terms of the quality of ingredients, it was a pricey burger. Rating…3 Bites 4 in terms of flavor, but the price and oiliness knocked this one down a full peg.